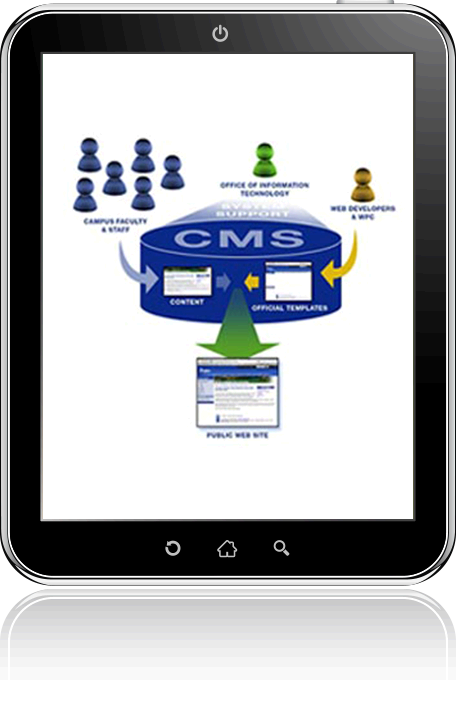 A CMS (Content Management System) is a computer software system for organizing and facilitating collaborative creation of documents and other content. POSOrbis offering of content management system is a web application used for managing websites and web content. WCMS: Web Content Management Systems assist in automating various aspects of web publishing. T-CMS: Transactional Content Management Systems assist in managing e-Commerce transactions. POSOrbis provides tools where users with little or no knowledge of programming languages and markup languages can create and manage content with relative ease of use; it allows non-technical users to make changes to an existing website with little or no training. POSOrbis WCMS requires an experienced coder to set-up and add features, and then it is primarily a website maintenance tool for non-technical administrators. POSOrbis uses SQL Server Database and other technique to store content, and a presentation layer displays the content to regular website visitors based on client set of templates. POSOrbis can create custom visual templates that can be automatically applied to new and existing content, creating one central place to change that look across a group of content on a site. POSOrbis WCMS provides WYSIWYG editing tools for non-technical individuals to create and edit content, becomes much easier and quicker to edit and manipulate. Workflow is the process of creating cycles of sequential and parallel tasks that must be accomplished in the POSOrbis WCMS . For example, a content creator submits a story but it's not published on the website until the copy editor cleans it up, and the editor-in-chief approves it. POSOrbis works with client on there workflow. POSOrbis WCMS provide tools for non-technical individuals for managing the life cycle of a document or Articles from initial creation time, through revisions, publication, archive, and document destruction. POSOrbis WCMS provide tools for non-technical individuals for managing the life cycle of Banners or Images from initial loading time, through publication, archive, and removal. Can also provide you solutions for rotation of images or banners on your site, empowering you to enrich your customer experience. POSOrbis WCMS provide tools for managing the managing hit counts and click counts on your banner. It can be extended to different areas. Dynamic home page is a facility which allows customers to change the content of the home page on seasonal basis or on some special events. Home page is always a key for every customer and POSOrbis core team works with the client and can provide management of multiple Dynamic home pages. POSOrbis WCMS provide tools to client to manage history of there prospective customers requirements or feedback, allowing them to improve and build there customer database, helps you to create your Mailing List. A survey is method of gathering information from a sample of individuals. The basic goal is to find out what are your customers or associates stand or opinion on your critical matters, products or your services. For example a Company creates “Client satisfaction survey” in order to get a better picture of how the clientele sees them and their service. POSOrbis WCMS provides powerful analysis tool in the form of survey, that helps the clients draw its conclusions and better there services. POSOrbis can empower you to make your site as professional online e-commerce solution for your business. E-commerce (electronic commerce or EC) is the buying and selling of goods and services on the Internet. POSOrbis T-CMS team creates customized solution and do set-up and add features. POSOrbis uses SQL Server Database and other technique to store your product and its related transaction, and provides administrative section to manage it. POSOrbis can provide you solution to upload and manage your stocks. This includes creation of your stock category and items. Special features like out-of stock items, images of items can be added as per requirements. POSOrbis can provide you solution to display your product on sale along with add buttons. POSOrbis can provide you shopping cart customized as per your need. POSOrbis can integrate payment gateway in your site to empower you to accept credit card, cheque, and cash-on-delivery. POSOrbis supports the leading credit card processors, including PayPal, Authorize.Net and VeriSign (We can customize for more). POSOrbis can integrate and customize reports to display sales by date range, customer names, and top sellers or as per your need.